Today I'm here with the amazing Robin Constantine. Last year I read, and totally fell in love with, her novel, The Secrets of Attraction, because, let's face it, Robin is a very talented writer and that novel was brilliant. Last year I had the pleasure of having Robin on this blog for Ask the Author, which you can totally check out here, so of course I had to ask her if she'd like to be part of this, too. Hmmm…this is a hard question! I think I write, as well as read YA because it’s all about self discovery. That’s something that will never get old for me! I ♥︎ Book Bloggers!!! Before my book debuted, I knew next to nothing about the book blogging community and to be honest it was overwhelming. In theory, you KNOW people are going to read your book, you WANT an audience, but when you’ve spent most of your time quietly working in your writing bubble and suddenly there are people out there reading and discussing your work - it’s a bit unsettling at first. So it took me a while to come out of my shell, but I’m so happy I did! Mostly though, I’d like to say THANK YOU! Thank you for being such passionate and voracious readers!!! Thank you for sharing that enthusiasm on your blogs - which is A LOT of work (and much appreciated!) Thank you for helping me become a more sensitive reader and writer, and for challenging me to up my writing game. I’m also continually in awe of how welcoming and generous the blogging community has been to me - and what fierce friends bloggers seem to be!! I would love to give a shout out to a few bloggers who have made my foray into social media a lot more fun - Meredith from Pandora’s Books and Stacee from Adventures of a Book Junkie, in particular, really helped me in my debut year. I’ve met fab bloggers like Tabitha from Bows & Bullets Reviews and Deitre and Moriah from A Leisure Moment at book store events - it’s always fun meeting bloggers IRL!! And I love, love, love seeing blogger friendships like Heather (The Turning Pages), Lisa (Dizneeee’s World of Books) and Joli (Actin’ Up with Books) - who even travel to attend bookish events together!!! It’s awesome that a love of books can bring so many people together! I write from home, and it’s so easy to become a hermit! It’s also easy to work too much - so I try and have a set schedule and make sure I take breaks to get out. Even if it’s just for a walk, or a bike ride. Spending all your time in one place can lead to burn out pretty quickly! 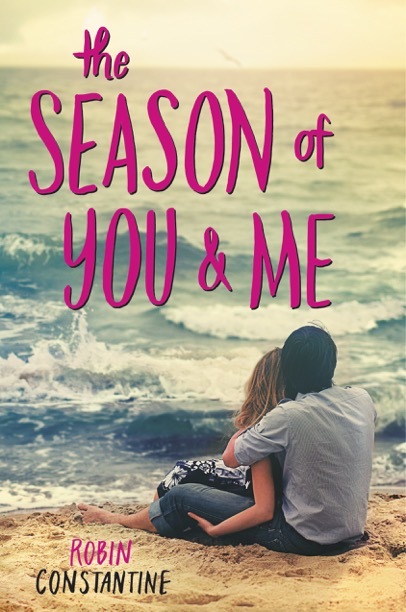 My latest YA Contemporary, The Season of You & Me came out on May 10th, 2016 and is close to my heart for a lot of reasons. I love the characters, Cassidy and Bryan. I love the New Jersey beach setting. And I loved writing a book that takes place over the course of a summer! While it’s being touted as a ‘beach read’ - I think/hope it’s a book that can be enjoyed any time of the year! Thank you so, so much to Robin for coming and answering my questions. What do you guys think of them? Also, have you read any of her books? If not you totally should give it a chance! Happy blogiversary!! I looooove Robin and all of her books. I'm quite picky about my contemps, but her books are some of my favorite.